Below you’ll find text from an email to my mother… It’s prompted after a scene in the movie Mr. Magorium’s Wonder Emporium where the Molly receives a block of wood which we come to learn is magic. You see, my mom had wanted me to watch a movie that she’d watched with Bubby, her pet name for her brother, my Uncle Randy who had just died. My mom doesn’t have anything to do with magic, to the extent that as kids we weren’t even really able to watch Disney movies or anything. You’d think that Disney was like the Illuminati or something, black magic and such! But with Uncle Randy on his death bed, the movie selections were all his—kind of like the way you divvy up driving and DJ privileges. So mom watched the movie with him, and did a couple of times, apparently it was a favorite and I wondered if he’d loved it quite the same, or had even seen it, before he’d known of his impending death echoing Mr. Magorium’s. What? Am I okay? She’s the one who’s watching magic movies! It was something of a moment of cognitive dissonance for me. You see, my mother doesn’t believe in magic because she’s a Jehovah’s Witness. Unlike other denominations of Christianity, Jehovah’s Witnesses do not believe that Christians will number in heaven like the stars of the sky, rather that there will be a specific number, limited to 144,000 only. This is all to say, my mother doesn’t believe my father is in heaven. When he died, a few weeks later I remember sitting on the back stoop as she explained to me death, it’s like the person [the mind] is asleep, and about how the body goes back to the ground as she crumpled that leaf between her fingers, as I still recall, though I was only a few years old. Now here’s my mother recommending that I should watch a movie which is all about magic, and a flying block of wood. And I wondered—if a block of wood can fly, then why can’t I? this block of wood is gonna fly. “there isn’t a word yet, for old friends who’ve just met”—for our matthew’s. besides the fact that i believe i’m going to heaven, and the implications that has on my social life, yeah. i’m okay. i had really hoped we’d get closer as the days of life passed by. 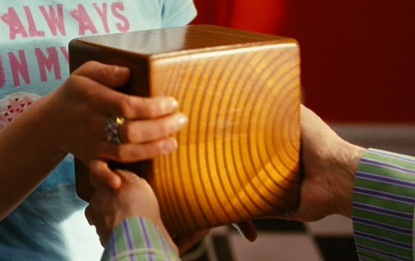 i have faith that could move a block of wood (finished mr. magorium’s wonder emporium last night) and that means i have to accept that my momma thinks i’m nuts. momma, i love you and i miss you in a way i’m not sure i’ll ever be able to express. i spent 9 months in your belly, but somewhere in the past year or so i’ve learned i am a nut. i’m a walnut. and i fell not far from the can chock full o’nuts, otherwise known as niblick. i feel like i know my father. i know him because he’s inside of me. i was inside of you, but he is inside of me. i always wondered what he was like, and i don’t anymore. he’s like me. we have differences of course. he didn’t start off scared, but fearless. i started life with a feeling of loss, which colored my personality a different shade of blue than his. but mom, don’t you get it? as you read those words, don’t you see how amazing it is??? those words, until i realized i needed to clarify to say i’m talking about daddy and not my heavenly father, have one and the same meaning. you tell me that those who have his blessing don’t suffer. but last summer, without realizing that it was a list of the sufferings of Christ (2 Corinthians 1:5), i suffered noting the eery vague familiarity. perhaps we fall into two different buckets? but my life? i’m honored. without intent or foresight i have lived out the lives of many of those honored in the scriptures. last year when i went to my first meeting (in years) I fully and whole heartedly expected them to give me a box of literature and tell me where i was going. i knew i was going overseas and on a boat. i didn’t tell them all that, i just asked where i could get literature for my trip. that’s when they told me that i would have to study with them so that they could make sure i knew all the changes in the organization… that’s when i realized something phenomenal. first, i was barking up the wrong tree. second, what happened that night in the kingdom hall in that meeting (which thanks to the web i was able to retrieve the content of that meeting that night a few months ago to go back through it) wasn’t about anything but me, and someone or something speaking to me. it’s taken me a year to be broken. to give up and give in and just start trying to tell the truth, though i know it will cost me my fleshly life, and my family. mom, i’m sorry that you will only most certainly believe that i am nuts, but i don’t understand this concept of “channel on earth”. He speaks to me. No, it’s not words spoken, but it’s the same as realizing i had to look no further than myself to see my father. sure, there are differences between daddy and i. we’re two different people. but i came from him and though he’s not spent the last 30 years apart of my life, though i have nothing to read, watch, see, listen, or hear about him, deprived of every sense of who he was, i nonetheless am his daughter, and probably the closest of his progeny to reflecting him. he who has seen me has seen my father also. can you imagine? i am holding back tears. i’m in public, in a cafe, enjoying the last day or so of freedom from employment, so i can’t cry. but can you imagine? my heavenly father put me through my life so that in living it eventually, at the time he designated for me, i would come to know who i was. i am both my father’s daughter, and my brother’s sister. oh the irony. matthew doesn’t know his father, in both meanings of the statement, and yet the brother i speak came from a heavenly home. (Matthew 12:50) and my spirit calls out—do you get that? my spirit?—Abba, Father! (Romans 8:15) i never knew my father, but that doesn’t mean i don’t know him. i don’t call him matthew, i call him daddy. meanwhile, i was adopted by melvin. i was first a daughter by means of creation, then a daughter by means of spirit adoption, similar to the way i was first a daughter by means of birth, then by means of law. but i am not a daughter of the law, neither am i of the flesh. i am daughter who was first born on earth, then adopted by spirit. i don’t call my father by his name, and am pleased because it distressed me to learn that the name i had been presumptuously using had nothing to do with his real name, and was simply a 13th century error out of Babylon’s Christendom… I’m happy, and it was my dad, melvin, who eased my spirit, unknowingly. he was the one who reminded me that jesus prayed, “Father”. He never used his name. Never. I don’t think it if I started calling my dad “Melvin” that he’d take too kindly to it. so, i know my father, and i call him “my Father”. in prayer I pray to him, using “Father”. one day, we will know his name. but we don’t today. and i’m okay with that because it made me realize how wrong we’ve had it. i asked darryl last year what the “good news” was. i wasn’t trying to be difficult, obtuse or ignorant. i simply wasn’t exactly sure what the “good news” that “we” were to preach is. i knew enough to know that a phrase that immediately comes to mind is “the good news of the kingdom”… but i wasn’t even sure that that news was. he didn’t have an answer. i felt like i’d put him on the spot. i still don’t know—do you preach the kingdom was established in 1914? that it’s here? that it’s near? i don’t know. i put that to the back burner and one day got my answer, and simply and then realized how much the bible is misunderstood. have you ever noticed the various “good news’es” in the bible? the “good news” in matthew, mark, luke and john is of the kingdom. but then that good news stop being proclaimed, and instead there was the “good news” that Paul taught. If we lived in the First Century, we would not have had the “good news of the kingdom” preached to us. do you realize that? it is simple truth. that message, that good news, went to the “lost sheep of the house of israel” only (Matthew 15:24). don’t take my word for it. read it and see. see that jesus very clearly stated it, and it was reiterated later by paul—he came to verify the promises made to their forefathers (Rom 15:8)—not us. paul on the other hand was given a different ministry and preached a different “good news” and that good news is the same that we’re still to be proclaiming today. that’s the good news of God’s “grace”—a word we never use, but i’ve since adopted since i realize the only reason we don’t use it is that we’re prejudiced. “grace” translate to “undeserved loving kindness” in the new world translation. it’s the same way “(people of) the nations” translates to “gentiles” in other translations. regardless, the point is the same, just sometimes more obvious in one translation and easier to miss in others. the good news is in the undeserved loving kindness, which is the definition of god’s “great” sacred secret (great, as there are more than one sacred secrets: Eph 5:23, 1 Tim. 3:16)—his undeserved loving kindness is that he extends his salvation to us, the people of the nations, even though we are not his chosen nation, Israel. that’s why there is a distinction through out the bible through to revelation between the chosen nation, and the people of the nations. that distinction is always maintained. that distinction is less obvious in the new world translation as well as others that translate “gentile” in another manner. translations that maintain the original “gentile” term makes it quite clear. now, i do not want to mislead you. in jesus’ ministry and the apostles good news of the kingdom, there was a distinction between the jew (and circumcised proselytes) and the gentile. the great sacred secret of undeserved loving kindness (or grace) changed that. that sacred secret introduced the body of christ. (Eph. 3:6) never before had a concept entered the mind of man. how could it? do you get it? does it sink in? i don’t know if what i see you can see. the other day i read a scripture that made me realize that indeed we can have varying degrees of eye sight. (1 Cor 2:14) you believe that only the 144,000 have that spirit, and i believe that all who respond to the “call”, who answer the phone, and accept The Truth over “the truth”, who hear and turn back (Matthew 13:15, Isa 30:21) When it comes to me expressing my spirituality, my faith, my beliefs, what I’ve learned—from the bible—you apply Zechariah 7:11. There is such sad scriptures speaking of such things, such as 2 Timothy 4:4 which was Paul speaking of our “crowd”, the people of the nations, or Hebrews 5:11 which is believed to be Paul, regardless of who wrote it, it being written to the Hebrews (Jews). All I mean to say, is it’s frustrating. I understand the scriptures now in a different way. Frankly, I never understood them before in the way that I was taught, now I understand them and I understand them different than you do. I feel like Paul, speaking to the Corinthians in his first letter, at 1 Corinthians 3:1. He goes on later to detail that they did “not discern the body”. 1 Cor 11:29. Can you discern it? He’s talking about the congregation, of which Christ is the head, which is his body. Which is, if you choose to accept it, is us. I find it so strange. The First Century Christians had to deal with the Jews who would not accept that Gentiles could be a part of “their” congregation if they weren’t circumcised. The whole point of the Great Sacred Secret, hid in God (Eph. 3:9) and never before known until it was revealed and taught by Paul, was that there would be a NEW body. A new creation. (2 Co 5:17) “Consequently if anyone is in union with Christ, he is a new creation; the old things passed away,—look!—new things have come into existence.” This is a joint-body, joint-heirs, a new creation. (Eph 2:13-15) Israel is not a new creation. Being “‘spiritual’ Israel” isn’t a new creation (well, it is, because it’s man’s new creation, or as the scriptures calls it myth, or “false stories” in the NWT, 2 Tim 4:4). The new creation is a new creation, it’s the sacred secret, the body of Christ. The greek word sussómos is used only once in the scriptures, and it’s at Ephesians 3:6 where it says, “namely, that people of the nations should be joint heirs and fellow members of the body and partakers with us of the promise in union with Christ Jesus through the good news.” What’s interesting is that this word reinforces the “new creation”. It’s not that the “people of the nations” (read: Gentiles) would become fellow members of the congregation of Israel, but rather that they would both come out, “that he might create the two peoples in union with himself into one new man and make peace; and that he might fully reconcile both peoples in one body to God through the torture stake” (Eph 2:15,16) “Israel” did not absorb the people of the nations. The people of the nations did not become Jews. No. There was a new body, the Christian congregation, a new creation, of which Christ was the head. Why does all this matter so much to me? Why do I keep repeating myself to you, trying to get through? Because I wish I could compel you to search out the truth in the bible. Because if you start to accept these basics which are clearly there, it’s not so far to before you end up at the end—Revelation. There the distinction comes back into play. Jesus’ sacrifice fulfilled law, broke down the barrier (symbolized in Israel’s day-to-day real life by the temple’s Gentile partition wall) between the groups, and calling out of the two groups members of his body, a new creation, the Christian congregation who is the body of Christ, it’s head. Then Revelation recognizes the distinction—the small remnant of Israel, as evidenced, and the much larger great multitude of Abraham’s promised which would number as the stars in the sky. Remember that Jesus came to verify the promises made to their forefathers. Hebrews speaks of those of the old testament who had a heavenly calling, though the old testament never really speaks to it, besides the more literal sense where prophets were caught away to heaven, like Ezekiel, or in psalms, like David. There are the first fruits chosen from the first presence of Christ on earth, and that number will be completed by his second presence, which is unique in that it is the only parousia (the arrival of a King, as opposed to his first presence). Did you ever stop to think about how the sign nailed above his ransomed body was prophetic. He was not at that time the king of the Jews, but it was proclaiming what he is prophetically and will be, and they will one day recognize him as such. Have you ever thought about how it is that Jesus’ disciples (and even apostles) did not know that he was Christ. No, it was something that they came to believe, have faith in. They followed him on faith, not because they knew. That’s why Peter’s confession that he was the Christ was so noted. That’s why Jesus said to keep it to themselves. He gathered those, chose those, the remnant of faith out of the lost sheep of Israel. They were all lost, but he chose as his first fruits those who believed by faith. He reinforced their belief by performing miracles, and fulfilling what was prophesied, but yet they didn’t even know at that time all the prophecies he was fulfilling. The key point is that it is by faith, not by proof. The scriptures tell us that in Christ’s parousia there are two groups called out in salvation, the remnant of the 12 tribes of Israel, and the great crowd of all nations, tribes and tongues. The great crowd is those who are Christians, and are of all nations and tribes, because the body is composed of both Jew and Greek (the largest portion of Gentiles in the first century congregation), as Paul instructs us with the reminder that we become one. (Galatians 3:28, Eph 3:4-6) Momma, “sacred secret of the Christ” is the great crowd of Revelation 7:4 of all nations, tribes—the body of Christ. The congregation of Christ. Whereas we know that that the congregation of God is Israel. (Galatians 6:16, Romans 11:1,2,4,29) And what happens when the bride, the one who has the bride is the bridegroom, to have the bride she must have existed and the Lamb came to the lost sheep of Israel to call out to her which his Father chose for him from aforetime, marries the body of Christ? By means of him, all nations will bless themselves. While we’ve always known this since the prophecies of the Hebrew covenant, we now know how it comes to be so. Through Christ those who have faith all become one family. How does it feel to know that the Watchtower tells you that this is not so? Can you explain to me why like the words of the prophet Zechariah (7:11) you’d refuse to pay attention, choosing instead of seeking out the truth in the scriptures to pay attention to the stories of men? Why is it that you would turn your shoulder to you own daughter, when the bible tells us that in the last days the sons and daughters would be inspired to speak, to instruct in the word of God, to tell forth The Truth? (Joel 2:28, Acts 2:17) Joel’s prophesy came true in the last days of the Jewish system, and they will come true in the last days of the Christian era. Why would you stop up your ears, protecting your mind from what you fear might be false teachings, but not turn to the scriptures to seek truth? I know you think it not possible that I could bear the word of God. I know that you know all about the horrid life of my past. I’m sad that much like Jesus was never accepted as the Christ in his home town because they couldn’t see past the carpenter’s son, it’s possible that there’s nothing I can do to reach your heart with the words I’m inspired to write. Honestly, do you get that? Is there any will power I have of my own which could match the tireless energy which inspires me to search out the scriptures eager to lay my head down to sleep each night hoping that that night might be another where I awake with more truth? Oh how I wish I could truly be no part of the world, to just spend my time, ideally in a tropical beach front location of course! studying the word of God day after day, the nights filled with dreams of truth. I know that the calm comes before the storm. I know that this isn’t for me, but for others. I know that the time will come that I will have to share my gift and that to do so will mean life or death. Given that I have no idea who I am, from where it is I am descended, I have no idea if at the end I will change, or if I will be slaughtered. (1 Corinthians 15:52, written to Christians, or Rev 6:9-11, the “full number/144k” killed for their witness). But you know what? It’s a thrilling prospect! No wonder he made my training so hard! I had wondered when it would be complete! If I were him, I would have given up on me long ago. Never would I have imagined such a wonder-ful life! Never could you have designed such a story to be my own! Momma, can you imagine last summer those days where I prophecy by prophecy came to the realization that I was suffering the same, but in lesser way, as Christ had? Why did he suffer that way? So that he could understand our sufferings. Why have I suffered? To be given compassion. Did Christ have to be destitute to understand? No, and similar to the way he was cared for, I am too. I know what it’s like to have a hungry tummy, to know that you cannot face the world, even though the refrigerator is empty. You know what I did? I did what was spiritually instinctual, I had faith. Couldn’t have told you in that moment what it was, or that that was what I did. But it is. He brought me much lower than to my knees. Moreover, it wasn’t my flesh that had to be broken. It was my mind. I know the moment it happened. It sounded like something popped in my brain and shutdown. It was the middle of the night and you lay next to me. My eyes were closed, and I heard this sound from inside my head and I thought that I died. It was so strange to realize that that thought was a thought that inherent in it was that it was my last thought only that it was not. I look back to that moment and realize that it was, simply in a sense different than I expected. I died, as to myself. But my flesh is alive, I now live by spirit. It took a year to understand all this. The hospital is an interesting thing. Do you know what it is to have all the things happen that have happened to me, and then on top of that to take away my rights to my body? Its one thing for them to be stolen—to be raped, is wrong; to be beaten, is wrong. What they did was legal, condoned and to take my rights away was their right. I no longer believed in the world, I no longer believed in my body. It is and there is nothing you can do to change this, mine. My body is not mine. It is a vessel in which I live on this earth. Without it I cannot live on earth. One day I will not live on earth, but I will live. How do I explain this to you? I have no idea. I can’t explain the basics to you much less try to explain “me”. In the New Testament/Covenant (the time after the kingdom offer of Matthew-John, Acts) the promise was to the body of Christ, to be united with their head, in heaven. Those who believe will receive their promise. The body of Christ did not exist prior to the New covenant/testament (those are synonyms) as neither had there been a heavenly hope revealed. Have you ever stopped to think about that? The apostles didn’t even grasp that they were and are going to heaven. Why? First, because it wasn’t revealed until the Great Sacred Secret. Of course as soon as people know the truth they want it. But inheritance of faith requires that we want to seek out the truth. Heavenly inheritance of Israel goes to those first fruits of his first presence who were seeking him out and believed it was he, who were baptized, cleansing themselves prior to his arrival, eager to meet their Messiah. In the last days we experience a cleansing as well. I am a case in point. I shudder to think the things you might know about my life. While Pentecost 33 CE saw holy spirit poured out on the first fruits, the first harvest of the first coming of the 144,000 reaped as fire flames above their heads in the harvest of the last days of the Jewish era, in the last days of this era, the Christian era, “the ones having insight will shine like the brightness of the expanse; and those who are bringing the many to righteousness, like the stars to time indefinite, even forever.” (Daniel 12:3) Oh the beautiful simplicity. The father of the great multitude looking up into the sky—did he know that his promise foretold would literally be as the stars in the sky? “And as for you, O Daniel, make secret the words and seal up the book, until the time of [the] end. Many will rove about, and the [true] knowledge* will become abundant.” (Daniel 12:4) Last summer there was the door to paradise. I didn’t open it. Last summer the phantoms of Los Angeles arrived wanting to make me a star. I wouldn’t have it. Men came to me, a series of them, wanting to give me the riches of the world—culminating in the David’s. That’s what amused me most. Who knew my crush on the King? But seriously, who believed I’d trade in my adoration for the King for a David? I spoke to my friend who is Christian, not JW, and told him my silliest secret after having the realization that someone had stolen my secret—my crush on King David—as evidenced in it’s use to seduce me to give up the kingdom of the heaven for the earth, that I believed that I would be of the bride of Christ. You know what’s funny mom? Either way, it seems to me that all things are equal. I know where I’m going, and what my journey entails. All I don’t know is who I am descended from of earth. All the spiritual things are known. So much understanding has been given to me. It’s not mine. It is a gift. I certainly did nothing to deserve it, unless it was to survive all the sufferings with faith still intact. I am at terms with all of it, simply for the fact that I know now that the sufferings were to complete those for the Christ—the body, the congregation. I bore my torture stake, and now I’m moving into a different state of being. Now is the time to rest, and build up my spiritual strength. I am in school, being taught, coming to maturity and into complete accurate knowledge. I don’t know where it is to reference it for you right now, but there is a telling scripture, Paul I believe was speaking of the complete truth, and how it was that they did not have it. Daniel verifies this statement because in The last days—our last days—that knowledge would increase. These are things even the angels are interested in. Isn’t it thrilling? Is this happening to you like it’s happening to me? Oh how I would love, love, love to have someone to share this experience with here on earth. Abraham had two sons, Ishmael the first born of Hagar, and Isaac of the promise by Sarah. From Ishmael came the Arabs, from which Muhammad descended, the prophet of Islam, forefather of the Muslims. The Koran, the (not holy) scriptures (but still inspired; test the inspired expressions) of Muhammad are quite similar to our own. I have only researched it, not read it. The point to take away is that the Holy scriptures, God’s word the Bible, tell us that he will not inherit with the son of the promise. (Galatians 4:30) Now, this is the source of the entire conflict in the middle east between the biblical nations of Assyria and Babylon which are today known as Iraq (97% Muslim), and Israel (~75% Jewish, ~17% Muslim, ~2% Christian). Do not be misled. Despite this fact, Israel is to suffer because they are still under the condemnation of prophecies in the bible. But soon the nation as a land, while not the people, will see it’s restoration. This is to say it’s not the people living in Israel, but the dispersed Israel who will return to the land, which will be restored, as prophesied. However, the Koran of the Muslims foretells a Messiah who is the anti-Christ, the false Christ. al-Mahdi is “the rightly-guided one” who, according to Islamic traditions, will come before the end of time to make the entire world Muslim. He will do taking the world by force. We know that in the last days the antiChrist signs a 7 year treaty (covenant; Daniel 9:27). It seems as though Obama winning the election in a two weeks time is that start of events that kicks off seeing these things come to be. I’m not saying that Obama is the antichrist, but that there is this inkling that somehow he has is playing a role in our last days. He will only be in office 4 years (since it’ll be his second term as president). Personally, I’ll be interested to see if there is any move to perform agreements with the EU, UN, and how the US-Israeli Defense Treaty goes. I respect that all your work keeps you busy, and that you have little time left between the long weekend in Orangeburg and mid-week at home. I adore how you care for everyone around you, particularly those in the old folks home. But could I beg you to spend as much time simply studying the Bible as you do the Watchtower literature? The Bible is God’s word. The Watchtower is not God’s word, but an interpretation of it. They have been wrong time and time again. They call it the light getting brighter—but can you afford to ignore God’s word while you wait for dim bulb to get bright? bright enough to finally be the truth? I mean by the time they figure out who the faithful and discreet slave is, the end might have come already. I don’t mean that in a sarcastic manner, but in a factual manner. The faithful and discreet slave is determined by the Master’s coming and determining it so. They haven’t yet gotten that right—but they finally acknowledge that they haven’t been appointed over the belongings yet. I was trying to tell you that—but you thought I was an apostate. Was I an apostate? No, I told you. I could only be called apostate by the Watchtower, because I believe the Bible over the Watchtower. Now, was I an apostate? Even if you yes, do you realize that I am now, in that regard not? Because they changed their minds and issued new light. And that new light is closer to the truth, and is what I was trying to tell you. Now, momma, please reason. If they have not yet been appointed over the Master’s belongings, why is that? Can you explain that? If you pray on it and read the scriptures before they publish their explanation, perhaps you’ll might wipe the duck poop from your eyes as you awaken. Can you see clearly now? Please momma, turn to your heavenly Father and ask him for the fulfillment of the promises of the provisions meant for you—holy spirit as your helper to guide you into all the truth, accurate knowledge, and to know him and his son he sent forth into this world. In good humor, and heart, and all my love. I hope my words are sweetness, not bitter.